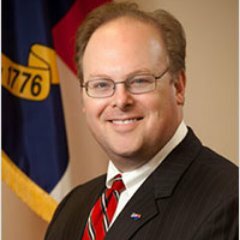 After a successful first term as chair of the North Carolina Democratic Party, Wayne Goodwin was reelected yesterday by the NC Democratic Executive Committee for another term. "Over his first term, Chairman Goodwin oversaw a historic partnership with Governor Cooper that recruited quality, diverse candidates in all 170 legislative districts for the first time ever; achieved record fundraising success; and launched a groundbreaking statewide organizing program. As a result, North Carolina Democrats swept statewide judicial contests, including electing a new Supreme Court justice, and broke both legislative supermajorities. "In addition, Chairman Goodwin spearheaded a rural listening tour to reach out and hear from rural North Carolina communities, and oversaw investments in local and municipal races that flipped 22 Republican-held seats and helped elect new African-American Democratic mayors, including the first female African-American mayor of Charlotte." Congratulations, indeed. He definitely deserves another term. Still lots to do in NC but a great start has been made under Wayne's leadership.